Me and my family stayed in the hotel for 2 weeks. The room was really spacious and the maid came on a daily basis. Our beds were only changed once in the time we were there and i know this as there was a mark on one of the sheets that was there for over a week. The brochue states that there was air conditioning which there was but it was absolutly useless. I have rated a 3 for location as there was not much at all in roquetas de mar so i cant really say it was located well. The staff were really helpful and friendly so no problems there. The swimming pool was great apart from it is 1m 20cm at the shallow end which aint really shallow if you have young children. As for the entertainment it was great if you were fluent in spanish. We have just spent a great week at this hotel, we stayed half board. Although the accommodation was clearly 4 star the food was probably only 3 star. Breakfast was ok, dinner was very much the same every night, hot and cold buffet style, but if you didn't go down early we found the food to be on the cold side. Staff were friendly in the restuarant. Generally staff were friendly throughout, although we found the 'Happy Hour' staff a bit miserable and sometimes only 1 barman serving, which made it hard to get a drink! Our room was very spacious, with lots of mirrors, extremely good shower, air conditioning seemed to struggle a bit, but was ok. great to have a fridge! BBC news, which kept going off! Saftey deposit box in room was a bit expensive to hire for a week, so we didn't bother. Pool was clean and plenty of sunbeds at the time we went, but felt a bit enclosed, overlooking other hotels. No sea outlook as a couple of streets back from beach. All in all an enjoyable holiday, not sure we would go to this hotel again, simply because it did not overlook the sea. We had a two bedded apartment for 2 adults and our two children (11 and 8) for a short 5 day break. Cannot fault the accommodation, very good value for money, clean and nicely furnished. Outdoor pool was very nice (and slides for the children) but when we went it was freezing, only complaint was that the indoor pool was quite small. The hotel was close to the beach and tourist attractions of Playa Serena. We stayed Selfcatering so we cannot comment on the food. The rooms were cleaned everyday and the towels changed also. If you do not want the room cleaned then you can put a sign up on the door saying so. 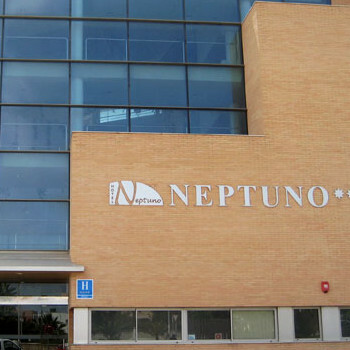 We holidayed at the Neptuno between the 1st and the 8th of June. The hotel is really lovely and I think only about 3 years old. It was very clean and all the staff were very friendly and helpful, especially the house-keeping staff(As both myself and my son suffered with a viral infection whilst on holiday, nothing to do with the hotel). The food was very good, we ate breakfast and dinner in the restaurant, this was a hot and cold buffet at both meal times and although very good did get a bit samey. The hotel is well situated in the Playa Serena area of the resort and not too far away from the supermarket, bars and shops and a number of other hotels. Make sure you use the rear entrance of the hotel, which you get to by walking through the pool area, keep to the left hand side of the first-aid building, down the little path and down a few steps and the entrance is there(This cuts out walking around the outside of the hotel and is great when you have lots of bags to carry), One other thing, you need your room key card to get in as it is a security door. The evening entertainment in the hotel wasn't up-to much and they seemed to have bingo every other night of the week, I will say one thing though "Ramon and the rest of the animation team were very happy and motivated and seem to make the best of things. There is a mini-disco for the younger children but this doesn't start til 9.30pm by which time my 7 year old was ready to go to bed. Holiday got off to a bad start with a 7 1/2 hour delay and by the time we took off from Manchester, Almeria airport had closed so we were diverted to Alicante and then had to endure a 4 hour coach journey, instead of arriving at the hotel at 20:00 hours Thursday evening we eventually checked in at 07:45 hours Friday morning.....thanks to Thomas Cook !! The bedrooms were clean and the large beds comfortable, plus a free fridge in the room, the hotel is set back a street from the beach so there were no sea views, our balcony over look a walkway which seemed to be used by the locals as toilets for their dogs. The reception staff were all very friendly/helpful, as were the maids and most of the restaurant staff, unfortunately the same could not be said about the bar staff. They call it a bar it really was no more than a cafeteria, and reminded me of a service station. We hardly saw anyone using it, we ventured in at first, but it was an effort for them to serve you never mind a hola! There were always a group of Spanish men playing card and dominoes in there, who of course got served at their table (with water and coffee! ), where as we had to go up to the bar to obtain a "real" drink. It transpired that the Spaniards were not even staying in the Neptuno, but were locals that came in each night to play their games. The atmosphere in the "bar" was zilch and even though they had a happy hour 7 - 9 each evening it still didn't encourage any holiday makers to venture in. We came to the conclusion we would rather walk to a bar outside the hotel and pay more for drinks than sit in a "working mens club" environment. The only entertainment we saw in the evenings was at a weekend when big groups of Spanish arrived Friday until Sunday and then the total sum of entertainment was bingo! There was not one "professional act" on the two weeks we were there. They didn't even have a separate room for the so called entertainment, they just moved the furniture around in the reception, brought in some plastic chairs to sit on and that was your lot, but the Spanish groups seemed to like it. We never had any problem finding a sunbed around the pool, as the hotel is mainly full of Spanish and thankfully they don't go in for sunbed hogging. The restaurant staff seemed very keen to set up tables well in advance. If you went down for breakfast around 9:30 (they serve till 10:00) you had a job finding a table that wasn't set up with wine glasses for lunch/dinner time. The lights in the restaurant were turned off at 10:00 sharp at breakfast and the chefs would then start clearing the food away, and the same in the evening. By 20:30 (served till 21:30) the tables were nearly all set up with breakfast things...which leads me to the food. Adequate would be how I would describe it, there were all the usual things at breakfast, but you did have to wait for the "pleasant" chef to come out of the back to fry a egg!! The show cooking most nights was a farce, mushrooms and green beans!! We only had two lots of proper meat and that was they last two evenings (chops and steak) the rest of the time it was all "cheap cuts" in stews, the fish was fine, most nights and tasty, if you are a fish lover you will be ok.
All the other 4* hotels we have visited have always had a carving joint, but there was no sight of anything as substantial here. Plenty of salads and vegetables and the usual rice pudding, cake and a very well stocked ice cream freezer. We thought we had found a bargain with the house wine at only 6.80 Euro a bottle and quite nice considering the price, that was until we went into the local supermarket and could not believe our eyes to find it was only 1.35 Euro a bottle in there....good job I'd taken a cork screw !! There wasn't much to do in the evenings unless you wanted to sit in English bars watching soaps followed by Bingo !! We found a bar that had karaoke, but only 3 nights a week (Y. Da. Wakes) and another who had a duo playing 6 nights a week (Boulevard)....and basically that was your lot, its not that we were looking for discos etc, but its nice to find somewhere to sit and have a drink with a little bit of something going on. We visited Almeria twice we went on the local bus, it took about 50 min, they run every half hour, Almeria Castle is well worth a visit and the City is very pleasant as well, full off ramblas. We had lovely weather and it was certainly a lot warmer than I expected for early October, but to sum up if you want a very, very quiet holiday then the area is ideal, but I'd look for a genuine 4* hotel and not one that in my opinion should only be rated at 3*....and if you are a bingo lover you'll be in your element !! A great hotel with friendly staff. Internet access and a great swimming pool with 2 slides and two more pools one for the babies and another for the not so good swimmers. I can't comment on the food as we was self catering but the bar was very nice and clean with friendly staff as was the hotel rooms. My only bad point would be that we did not have a toaster in our room but the room was spotless clean and fresh towels every day and cleaned very nice. We have just returned and was amazed that this hotel was not packed with children in august and on one day there was still some spare sun loungers around the pool. The entertainment is mainly aimed at the Spanish but there is enough to keep you entertained around the pool and around the resort which makes for a very relaxing holiday I ould rate Neptuno a superb holiday and give it 9 out of 10 overall (minus 1 point for no toaster). Having found this site so useful in the past I thought it time to do my bit. Here goes. Sorry if I duplicate what has already been written on the Neptuno, but this is the way I see it. We had a very nice holiday, marred slightly by my son's broken arm! We thought the hotel was extremely clean, smart and attractively laid out. We stayed in a two bedroom apartment which was a lovely size. Two nice size bedrooms, a good size bathroom, but no bath. The shower was very large, and easy to stand inside with a child to help them shower. The beds were extremely comfortable (for us, but not if you like squidgy beds!) The air conditioning was bliss and we had no mosquito bites the whole holiday!! The living room was simple, one sofa, one chair, coffee table, dining room table and chairs. Sideboard with TV. You can only get two English channels but we took my son's play station due to his arm, and this worked fine which meant that the kids could also watch DVD's and play CDs too. The kitchen was a little understocked. It was a very nice size, with good size fridge freezer, microwave, two electric hobs and coffee machine, however there are no kettles. I knew this before (due to holiday-truths) so took a travel kettle. And not having an oven was a bit of a pain, but gave me a good excuse not to cook!! We ate in the hotel restaurant one evening but were not overly impressed. I guess it was typical hotel buffet food but with a Spanish twist. The guests were mainly Spanish, I would say 90% Spanish when we were there. This was not a problem as they are all families and in general very pleasant. We did however find the sun-beds a bit of a problem - ie it was the same old saga of having to get up early and reserve a bed, or you didn't get one. There weren't enough to go round unfortunately. And it wasn't just the Germans or English doing it!! Everyone was bagging beds! The pool was lovely. Very clean. It has two waterslides, one is very fast and I did see two kids pick-up nasty cuts which had to be stiched, whilst we were there. Having said that, there was always a life guard on duty and both of them acted very professionally in treating the wounds. In addition to the big pool, there are two more little ones, one which is great for babies. For me, the entertainment - or lack of it - in the hotel let the place down a little, which is perhaps why I would choose a different hotel next time. It wasn't so much (as has been stated before) that it was biaised towards the Spanish - I speak very good Spanish and it was still pretty poor! What I found is that most evenings they would put on one thing and then everything seemed to just stop dead! Not great for atmosphere! Having said that, the entertainment manager - David - was absolutely lovely and extremely enthusiastic. Great fun doing the water aerobics with him of a morning! I think if you are looking for a quieter holiday with not too much loud entertainment, then this is the place for you.